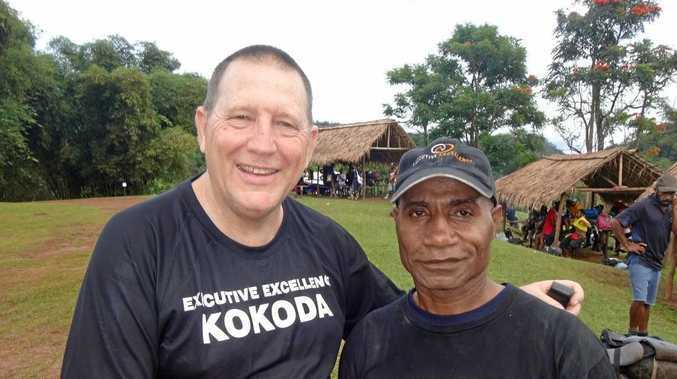 Neil Hancock on the Kokoda Trail with his guide. THE banking world lost one of its very best this month when Neil Hancock lost a 15-month battle with cancer, at just 59 years old. Neil started work with the Bank of NSW (now Westpac) not long after leaving school in Darwin. It began a 42-year career that earned him universal respect from colleagues, clients and business associates. Associate and 'best mate', John Bryant said there was nothing his friend didn't know about the banking industry - from agribusiness, currency markets and hedging to business risk. "He was incredibly ethical, honest and just a world of talent," John said. "He could assimilate with large corporations or the small business on the corner and reach out to people to genuinely solve their problems." Neil was proud to wear the Westpac logo but also understood his industry didn't have a good name. John believes a lifelong career was partly what made him different. "He started as a bank teller and worked his way through; that's unusual," he said. "He understood the process of the bank." Neil worked his way through international banking then financial markets, managing interest rate risk, foreign exchange and commodities. It was also where he met his wife, Robyn. 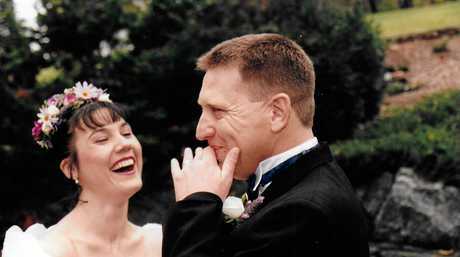 Neil and Robyn Hancock on their wedding day in 1995. "Neil was a very funny man, very ethical, always joking; he always got the better of everyone in conversations," Robyn said. "Nobody ever got one over Neil. He was very articulate. "He used to say he wore the pants in our marriage, but that I told him which ones to wear." Twelve years ago, after a tragedy in Robyn's family, the couple moved to Yeppoon. 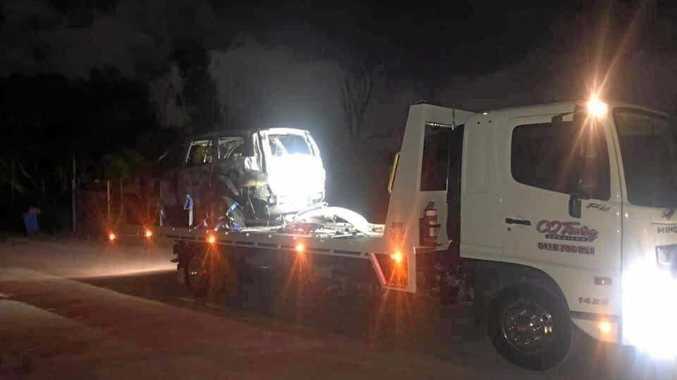 For Neil it was a very difficult to leave his two eldest children, the five sisters he loved and his mother in Brisbane, but he did what was right for his family. It was in Rockhampton that he met John, who first introduced him to his great love of hiking. "I told him I'd been on a hike with my son," John said. "His eyes lit up and he asked if I'd organise a hike for his family, but we went one better." In 2010, a group of families travelled to Tasmania and hiked the overland track at Cradle Mountain. 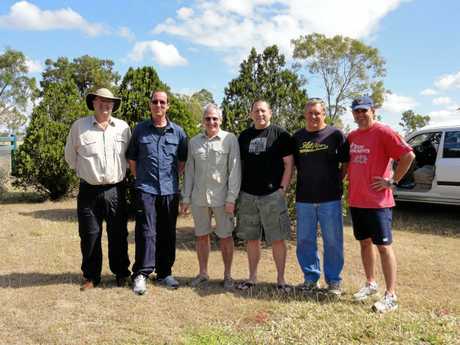 Simon Irwin, Scott McGregor, John Bryce, Neil Hancock, Ian Waraker and Clay Weston at Carnarvon Gorge in 2011. Every weekend after, the men hiked Mt Archer, going up the front face to their favourite rock where they'd boil the billy. Over the years, they hiked Carnarvon George, the Bay of Fires and Maria Island in Tasmania, and the Kokoda Trail. 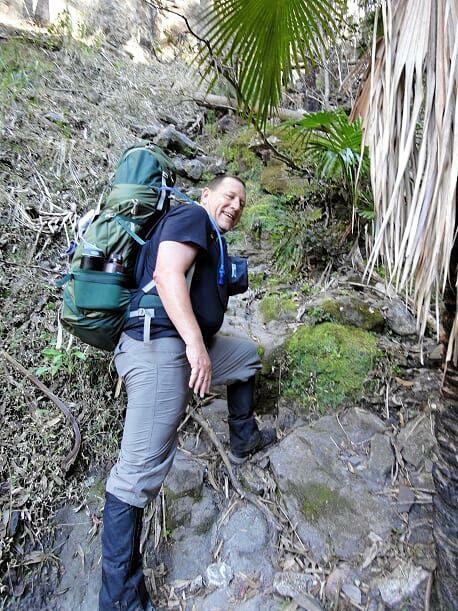 It was in May last year, while planning a hike on Hinchinbrook Island, that Neil first noticed something wasn't right. "Neil was very open about his illness," Robyn said. "He had bladder cancer and after 12 chemo sessions he got the all clear. "But at the three-monthly checkup an MRI showed four tumours on his brain." 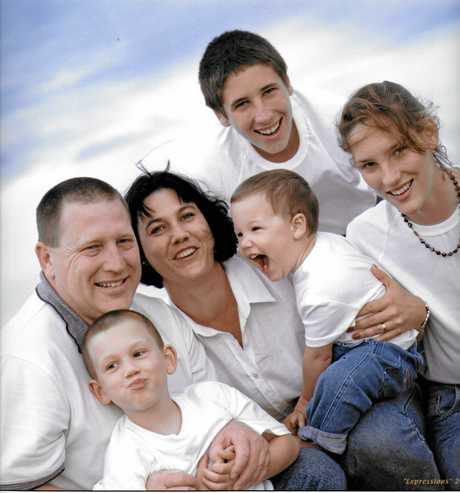 Neil died on August 12 leaving Robyn, his children Ian, Janelle, Rhys and Shannon, and grand-daughter Chloe. HAPPY FAMILY: Neil and Robyn Hancock with children, Ian, Janelle, Rhys and Shannon. At his funeral in Brisbane last Friday, Ian Hancock spoke about the man who would go to almost any length to do the right thing by his family. "He wasn't afraid to say 'you know, I stuffed up'," Ian said. "Dad never pointed the finger. He owned his mistakes and would crack open the black box in the burning wreckage to see what he could have done better. "He was the font of immeasurable wisdom, providing support and constructive criticism, with an appropriate amount of 'I told you so'. "Contrary to the 'dog eat dog' world around him, Dad knew the importance of the people around him." Vale Neil Hancock February 18, 1959 - August 12, 2018.